Iron Maiden Drummer Nicko McBrain and His FL-based Rock N Roll Ribs Host Official U.S. Launch Party for Hallowed. Coral Springs, Florida (October 26, 2017) – On September 29, Iron Maiden launched its latest collaboration beer HALLOWED in the U.S. to explosive sales and thunderous acclaim. 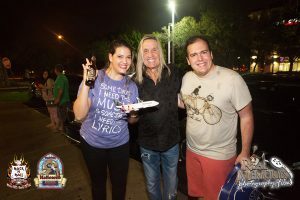 The brew was celebrated with a kick-off party at Coral Springs, Florida’s Rock N Roll Ribs, a restaurant which is co-owned by Maiden drummer Nicko McBrain and his longtime friend, Mitch Tanne. 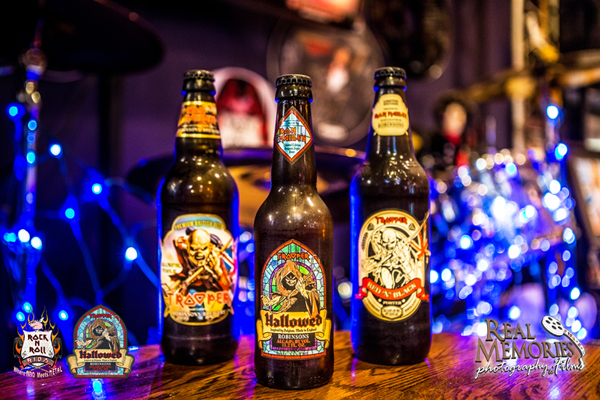 British rock legends Iron Maiden and drummer Nicko McBrain kicked-off the release of the band’s new Belgian styled beer, HALLOWED, with a celebration last week at McBrain’s Coral Springs, FL-based Rock N Roll Ribs. The celebration included prizes and surprises, including a performance from McBrain and Tanne, an inspired guitarist, playing a rendition of the Iron Maiden song “Hallowed Be Thy Name,” with two for one-priced HALLOWED beers during the song. The use of Belgian yeast within HALLOWED is a landmark occasion, as Robinsons hasn’t changed the yeast used in its beers since 1942. The yeast will also lend itself to a higher ABV than found in previous Iron Maiden beers. The bottle art for HALLOWED features Iron Maiden mascot Eddie garbed in traditional monk’s robes as a tribute to the beer’s Trappist Belgian inspiration. The art follows in the footsteps of other collaborations between Iron Maiden and Robinsons. These collaborations include TROOPER, which has sold over 15 million pints since its launch in 2013, and the previous limited-edition beers TROOPER 666 and RED ‘N’ BLACK. Do you manage a restaurant, bar or retail store and are interested in carrying HALLOWED? Interested in becoming a distribution partner for Robinsons Brewery? Please contact Lanny Hoff with interest. For interview opportunities with Robinsons’ Director of Marketing David Bremner or for more information about Iron Maiden’s HALLOWED and its availability for pre-order, please contact Lanny Hoff at +1 (612) 245-5433 or by email at lanny.hoff@artisanalimports.com. About Iron Maiden: With over 90 million albums sold worldwide, Iron Maiden is considered one of the most successful heavy metal bands in history, having played over 2000 live shows internationally throughout a career spanning over four decades and dozens of chart-topping hits. Iron Maiden’s famous mascot, “Eddie”, has been a steadfast figurehead over the band’s thirty-eight albums release, including sixteen studio albums, eleven live albums, four EPs, and seven compilations. For more information on the band, their tour and beer, head to www.ironmaiden.com. About Rock N Roll Ribs: Co-founded by Iron Maiden drummer Nicko McBrain and longtime friend Mitch Tanne, Rock N Roll Ribs satisfies two great passions…food and music. The Coral Springs, FL establishment combines thirty years of world-class rock ‘n roll experience and atmosphere with award winning BBQ ribs and signature sauces. Learn more at www.rocknrollribs.com. About Robinsons Brewery: A proud family of independent brewers, Robinsons is one of the most advanced and sophisticated breweries in the UK, with a worldwide reputation for real ale. Robinsons applies decades of experience to create exciting new varieties and choices of flavor that encourage drinking excellence. Combining original recipe heritage brews such as Old Tom (first brewed in 1899) and Unicorn (legendary since 1896) with innovative young ales such as Dizzy Blonde, Wizard and TROOPER (created with Iron Maiden) is what differentiates Robinsons… forward-thinking with the very best traditions. It’s an award-winning formula which has earned Robinsons real ale recognition for almost 180 years. Learn more at www.robinsonsbrewery.com.